Okay, I’m just gonna be 100% and totally upfront with my biggest “dislike” of this book. Not. Enough. Kissies. I WANT MORE KISSIES, DAMMIT. That first kiss I was just ermagerd moar, and then there were not enough of these darn kissies. A complete and totally good reason to read the second book. 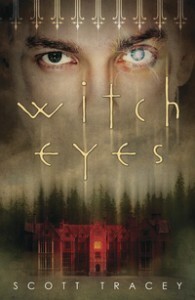 As for Witch Eyes, on the whole I liked it. I liked Braden, I liked the storyline, I liked the magic. But I didn’t really love any of it, which I guess is why this is a three star read for me. If I was still doing half stars, it would definitely be a 3.5 star rating from yours truly. I think one thing I wasn’t a big fan of was the quick movement of Braden’s relationships with everyone in Witch Eyes. You just don’t make friends that quickly! Or at least, introverted asocial people like me don’t make friends that quickly. But I don’t think your average Joe does, either. I just found myself questioning Braden’s BFF status with Jade and, to a lesser extent, Riley. Trey. *swooning moans* He was your typical paranormal romance love interest but I’m going to admit it right now that I love the typical paranormal romance love interest. I loved the hot and cold, I loved the whiplash mood changes, I loved the protectiveness. I loved the kissies. I want to see more of Trey + Braden together, without their angstiness in the sequel, because that angstiness got in the way of so much potential for relationship development and growth (and kissies). The storyline was pretty interesting, but I have to say that I got a little lost at times with the magic mumbo jumbo stuff. I was sitting there like: uhh what’s going on? What is that? Why is this happening? Either I wasn’t paying enough attention to detail, or there was room for improvement for the magical explanations. I think the “reveal”-esque thing really came out of the blue. Oh yeah BTW this guy’s EVIL. Eh? Since when? And now he has to be fought and taken down etc etc. I went along with it, but I wasn’t entirely convinced by the importance. The descriptions weren’t ace, but even so I had a pretty clear idea of what Belle Dam looked like. As for the people? I was completely making them up. All I knew was that Braden had brown hair. What about the length? What about his eyes, his skin colour? EVERYTHING ABOUT HIM. And Trey … shaggy brown hair + James Dean type sass. Okayyy, but still. I think a few more people descriptions could have gone a long way in Witch Eyes. I am sure I’m going to continue this series because I’m interested in the storyline, among other things (*cough*kissies*cough*).